Back in 2000, scientists discovered one of the largest icebergs ever detected. Named B-15, it measured 170 miles (270 km) long and 25 miles (40 km) wide. Now, some 15 years later, the iceberg has broken up into a number of smaller fragments, but one chunk is still surprisingly large. At its height, iceberg B-15 was nearly as large as the state of Connecticut. Icebergs typically get caught up in the swirling Antarctic currents and fall apart, but some, like this one, stay trapped in the cool coastal waters and remain there for decades. The largest surviving fragment of B-15, named B-15T, was recently spotted by NASA's Operational Land Imager. 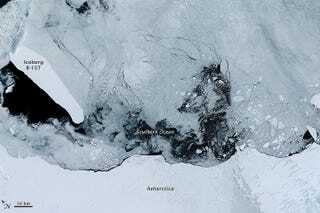 The object is located amid sea ice off the Princess Astrid Coast and measures 32 miles (52 km) long and 8 miles (13 km) wide. The U.S. National Ice Center (NIC) reports that eight chunks from the original are still around, but none compare to B-15T. Image credit: NASA Earth Observatory image by Joshua Stevens, using Landsat data from the U.S. Geological Survey.